The Primacy Fire Red dual sided ID card printer can handle any print job you are looking to do from just a few cards a day to 225 single sided cards per hour and 140 double-sided cards per hour. For monochrome cards if the cards are ejected at the rear of the printer the printer can do up to 1,000 monochrome cards per hour. This unit has conectivity with a USB or Ethernet connection. The Primacy has a large card feeder and hopper which each holding 100 cards and further allows you to view the status of the print jobs from the front of the ID card printer. The Primacy print resolution is up to 300x600 dpi when printing color ID cards and up to 300x1200 dpi when printing monochrome cards. If your facility requires a high level of security, please request a special quote for an electro-mechanical locking system to secure the blank cards, ribbon and encoding system. Evolis Primacy printer can be field upgraded to a dual sided ID card printer when your needs change and you want to print on both sides without having to manually flip your cards. 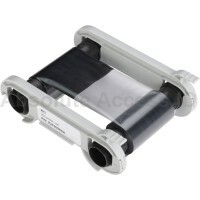 Also, the Primacy can adapt anytime with an integrating CLM (card Lamination Module) to extend the life of your cards. The Primacy is Windows compatable 32/64 bit, XP SP3, Vista, W7, W8, and W10. If you have any questions on the Primacy, call us today for any assistance you might need! CardPresso ID card software is available in five Windows and MAC OSX compatible versions. The v..